Well there’s a new photographic kid on the Shenton block and as you all know it’s not me. This is what I’m up to these days, being a Mum; I do school runs and oversee play dates. 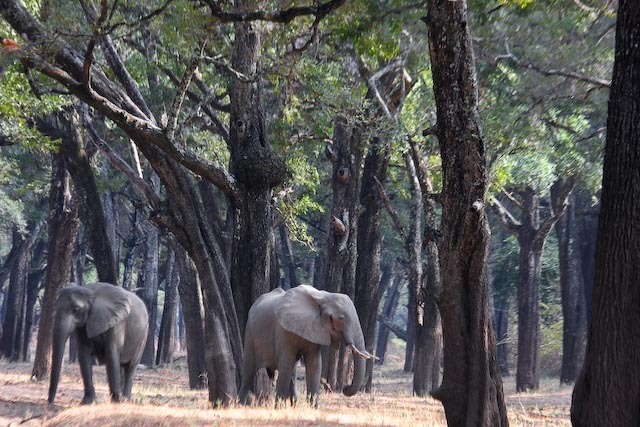 All the while the wilds of the South Luangwa are continuing along their wild ways almost as though I was never there! A dear friend and annual repeat guest of ours hasn’t been able to make it so far this year owing to other commitments. 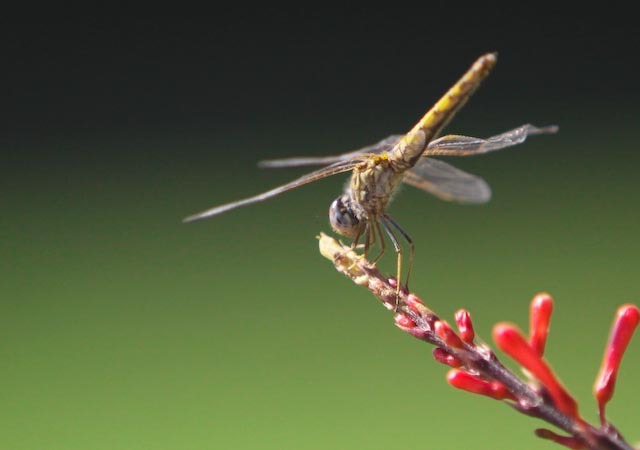 He recently sent me a photo of a bee amongst lavender, I reciprocated with a dragonfly on a blossom in mutual commiseration. 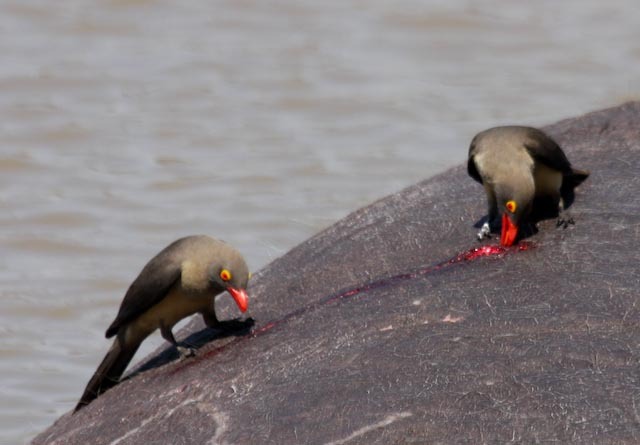 One must grab one’s wildlife wonders in whatever dose nature serves them up. 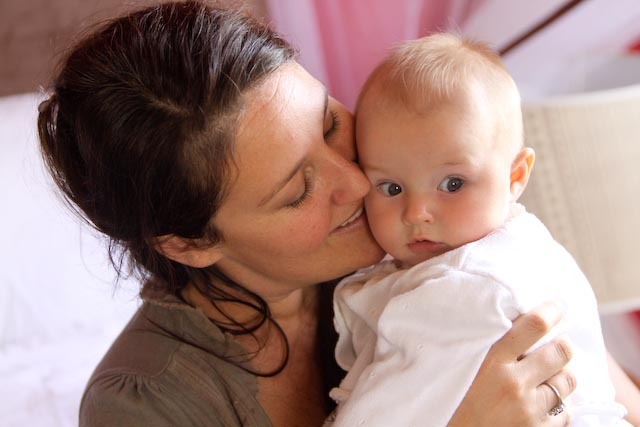 Derek picked up one of my hastily discarded cameras – after all I had pinched the video to record our flourishing offspring so the poor man can see as well as hear what they’re up to – and he hasn’t looked back (on losing the video that is). It’s quite tricky to take your own activities marketing shots. For starters you always need to have two vehicles moving together one for the photographer to sit in and one for the guests. This is something we try and avoid for our guests as we do our best to have them feel they are in the wilds on their own not with a million other vehicles. Secondly, if there did happen to be another car on a sighting, they were the last thing I was interested in photographing, no matter how good for the business it would have been. 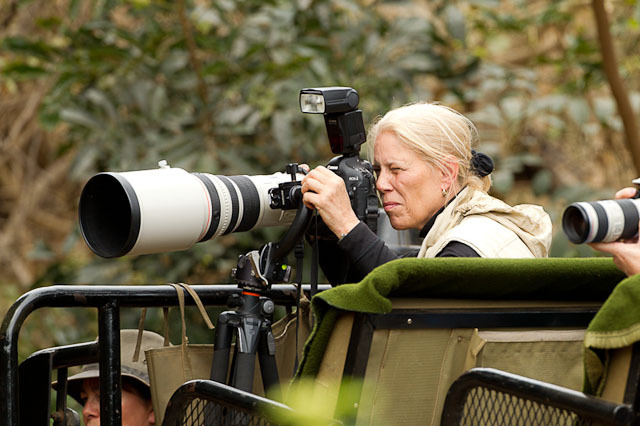 Any wildlife photographer worth their salt knows that when you have an image in your sights a sort of red haze descends and you do not take your eye away from that viewfinder for love nor money. It doesn’t matter if your neck is aching, your arms close to breaking and the person next to you (usually my husband) is shouting in your ear “Babe, look at that purple polka dotted hippo doing the Hoopla” you DO NOT MOVE, you DO NOT BLINK, you remain focused on your subject, quite possibly internally saying to your beloved “shudupshudupshudupshudup, don’t move you’re rocking the car shudupSHUDUP!! !” and wait for that priceless moment when your subject does that spectacular something that you just knew, if you waited long enough, that they would do. 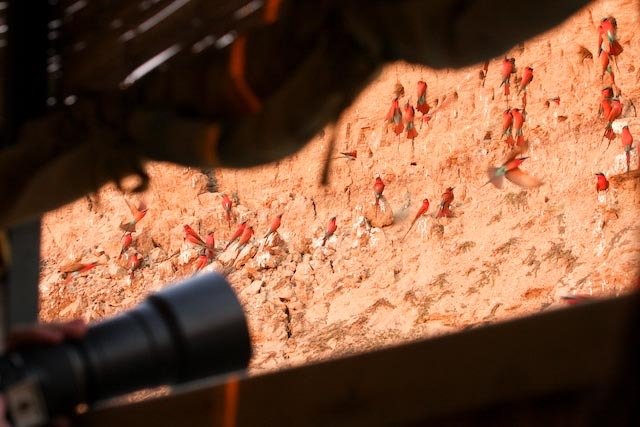 It’s MAGIC – give every hunter a camera I say – but I digress. 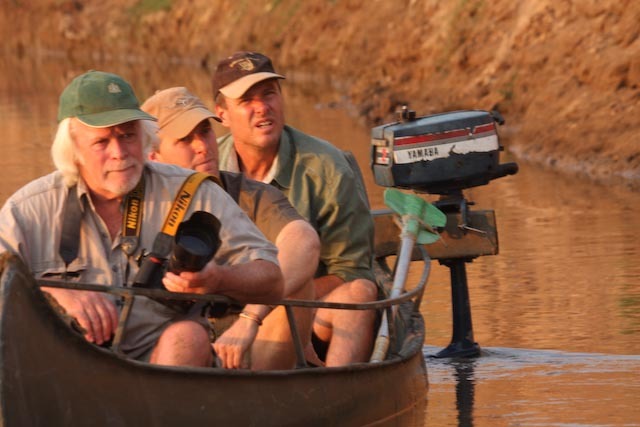 And in the canoe, the silver maned lion is the photographer himself. So this is what I’m reduced to these days :). 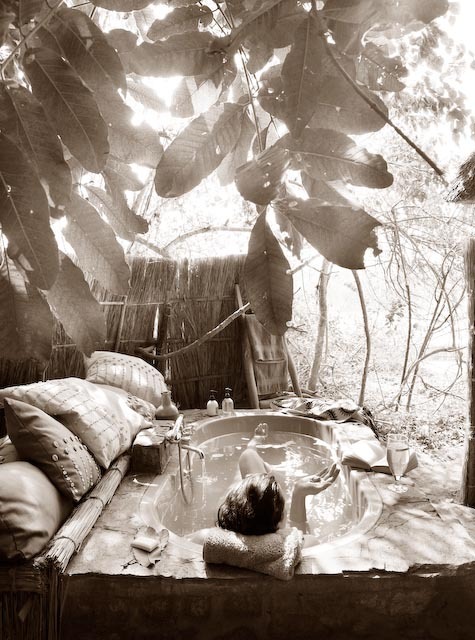 Gone is the wild and free jungle jane with a camera, these days I’m sitting at my desk in Lusaka editing Derek’s photos! I don’t mind really, we have beautiful acreage here and great friends surround me. However, I’m not sure the school run nor project managing a build makes for such interesting reading, so sadly, it does mean that I am going to run out of things to share with you. More and more I will hand over these introductions to Izzy. Having read Derek’s poetic insert for this month I think I’ve been surpassed in that area as well – you are surely in good hands! All the very best from me for the rest of 2011 and I’m sure I’ll be back in touch next year. September – our busiest month but also a good time to reflect on the season as such. Below are a few photos of work converting a new second hand Toyota Hilux into a game-viewer, which we did early this season. As you can see it’s a painful exercise taking the lid off a new car – not something the manufacturer had in mind in the first place. 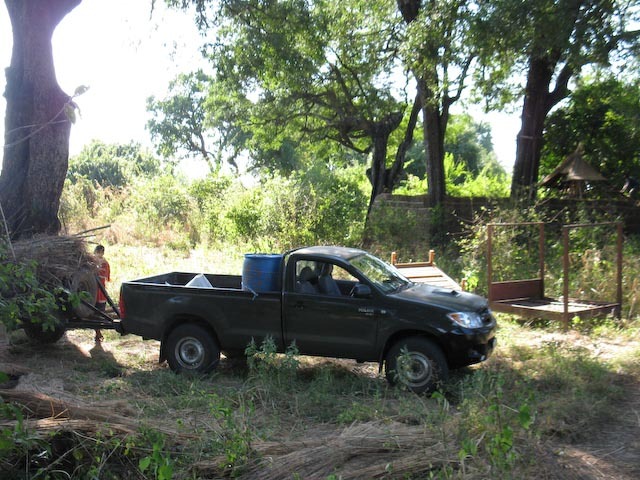 But like many aspects to running a camp – I’ve got to admit it was fun and actually I think the car is much nicer to drive (in the dry season) – somehow it has more space. 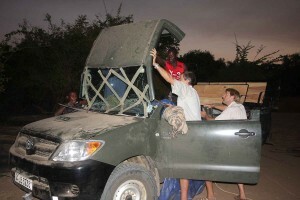 In summary this diesel Hilux is now a favourite amongst guests and guides alike. It is quiet, very comfortable, almost rattle free, very economic to run and everything works like new! 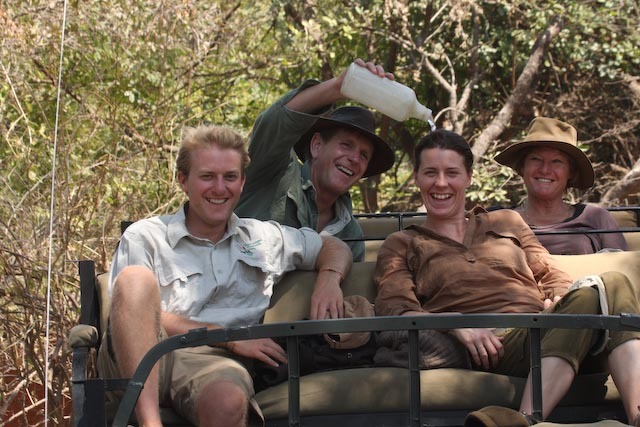 The safari season of 2011 has been one of our best. 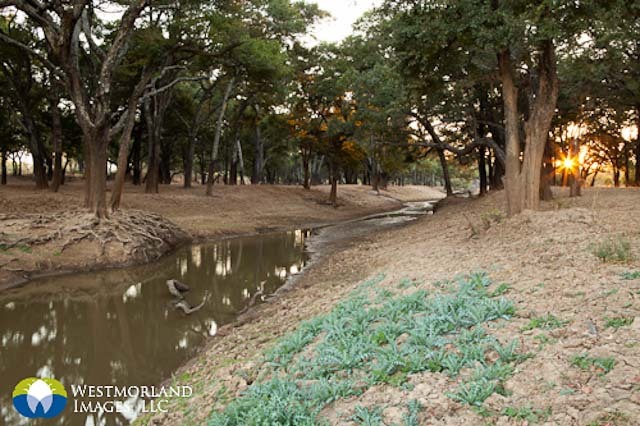 We have been busy from the start and our game abundant area has just kept everyone in awe of mother nature. During a week long “ photo-shoot” in late August we managed to capture some amazing moments of interaction with wildlife as shown in the sample of photos shown by Jules above. 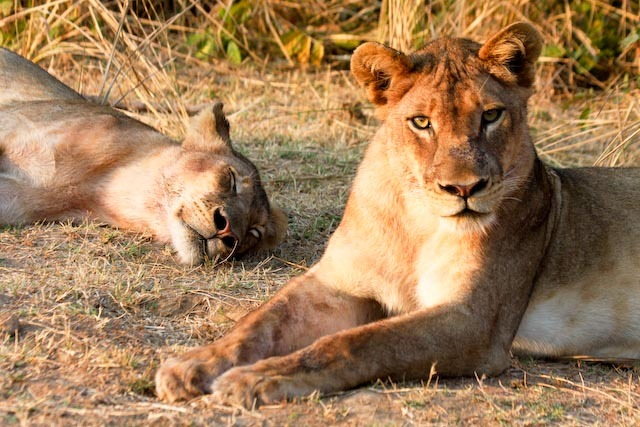 When I say “ we” I really mean Francois D’Elbee – a Lusaka based famous French wildlife photographer who has spent a lifetime in the bush himself. 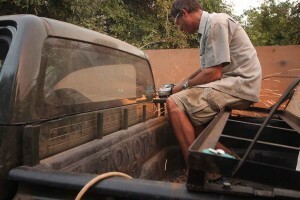 He did an amazing job of bringing to life what our safaris are all about. The “models” who worked tirelessly every day ; included, Lester and Sheridan Shenton – cousins of mine, who recently returned to Zambia from Perth, Australia. 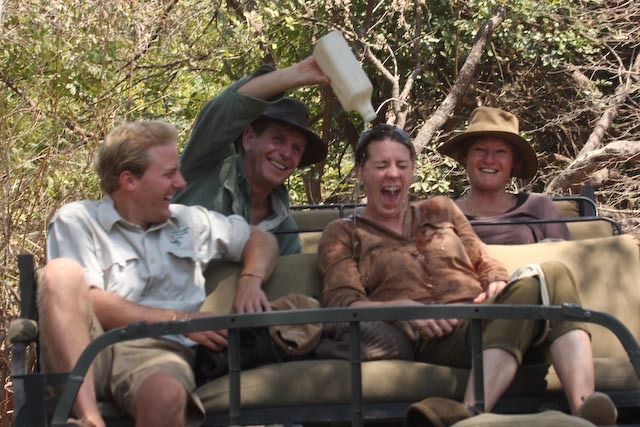 Olivia Dare – a friend of ours from Lusaka and Ian Friend – one of our guides at Kaingo also starred. Excellent humour right from the start added to fun and was an essential ingredient to the success of the shoot. 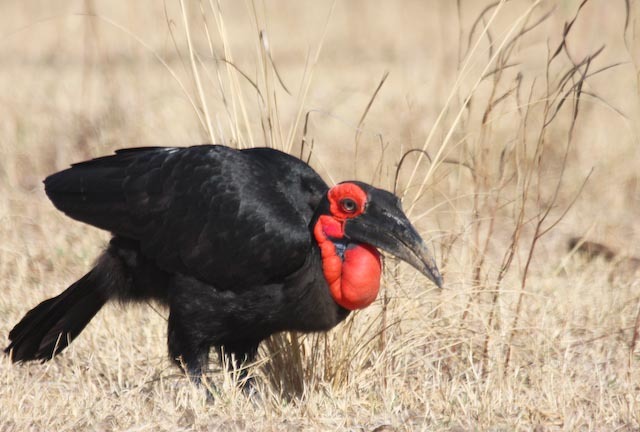 Since my talented wife Jules and the young ones are now based in our house just outside Lusaka, it is one of my jobs to use her camera to record some of the wildlife happenings on my drives and walks. So below are some of the shots from August . 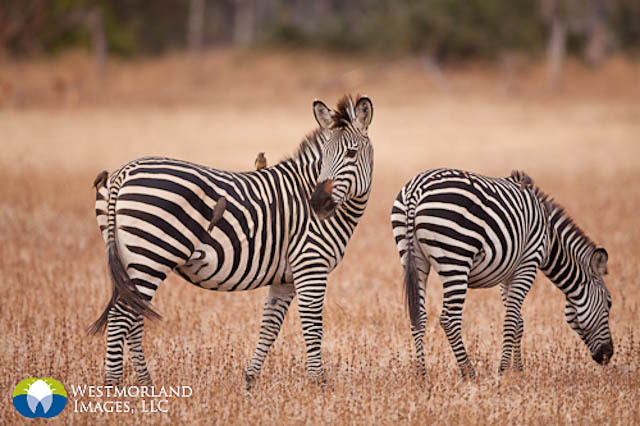 The Mwamba pride – continues to be active with its new coalition of three males. 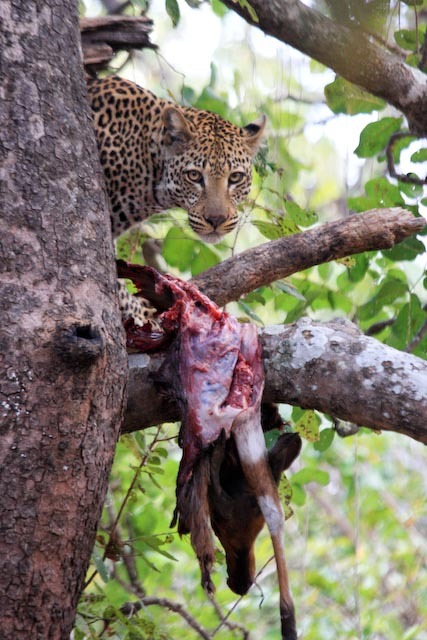 There are also a few photos of a leopard near Kaingo, on an impala kill. 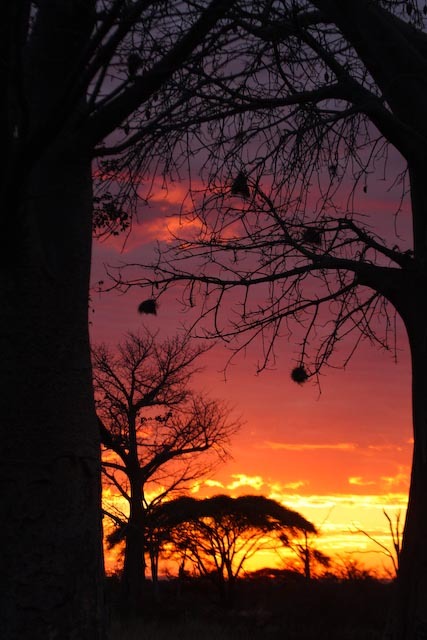 The Baobab Forest photos are an example of the amazing sunset silhouettes available from there. 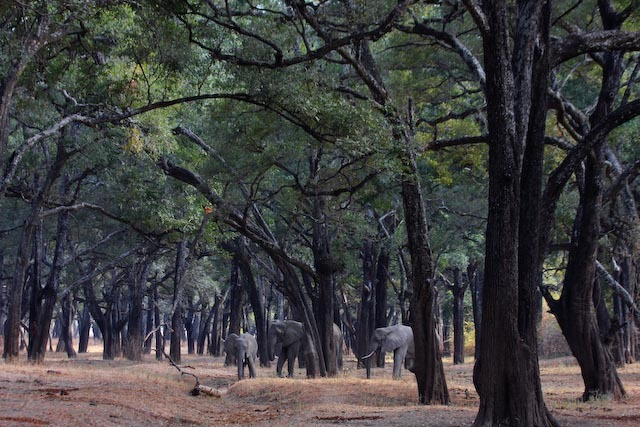 Another of our forests – the huge ebony forest right at Kaingo – has been raining fruit this dry season which has attracted large numbers of elephants amongst the other assorted birds and mammals that have a craving for this sweet and nutritious fruit. 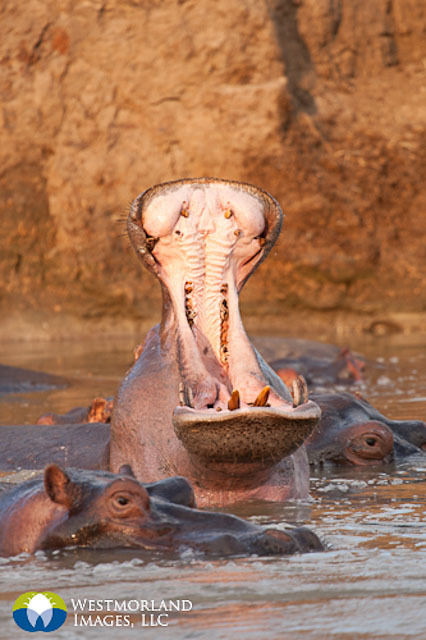 The hippo hide at Kaingo has been particularly good this year – even with the Luangwa river is quite low. 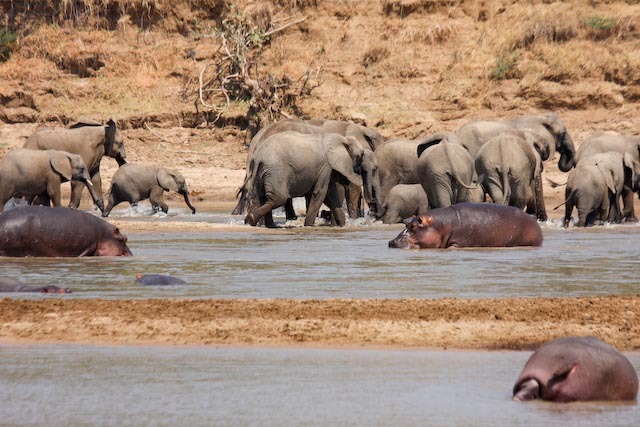 The Mwamba river confluence on which the hide is positioned still holds plenty of water and attracts an assortment of game. 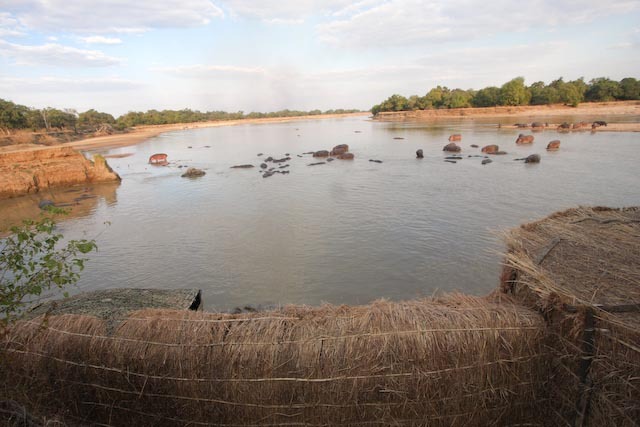 Just the other day , guests witnessed a group of thirsty elephants come down and push all the hippos out of their pool into the main river – much to the annoyance of the fifty “river horses”. The elephants literally shoved them out with their trunks and proceeded to bath and shower! 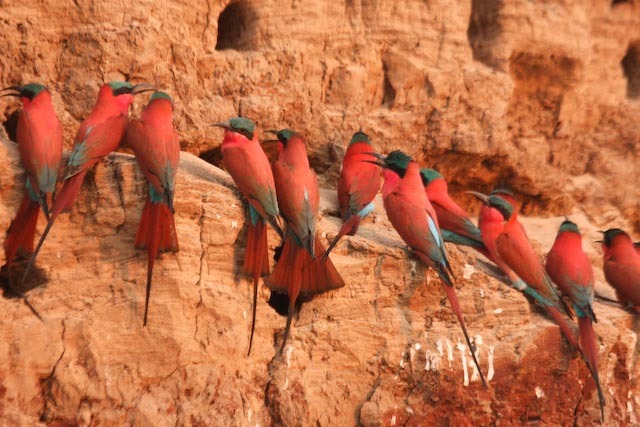 In the last week of August I put the Carmine bee-eater hide in front of one of the nesting colonies. 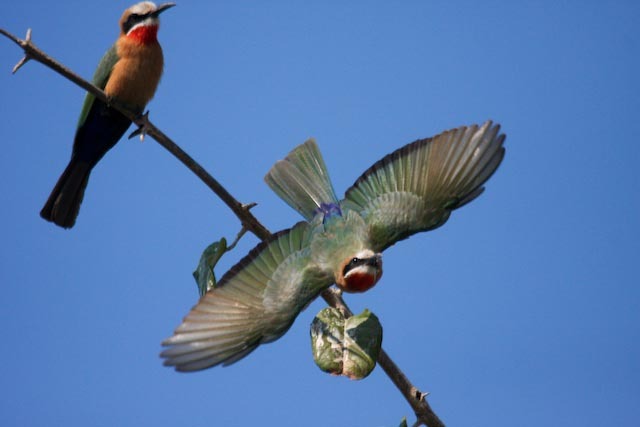 Initially just a handful of these migrants begin work on their nesting holes – often alongside locally resident white fronted bee-eaters but within a couple of weeks the breeding site is a mass of their beautiful colour and sound. 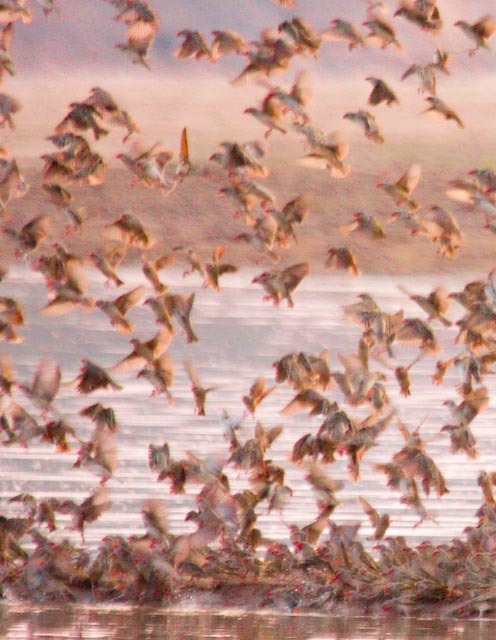 This year thousands of red billed quelea have been gathering at sunset to have a last drink from the river . 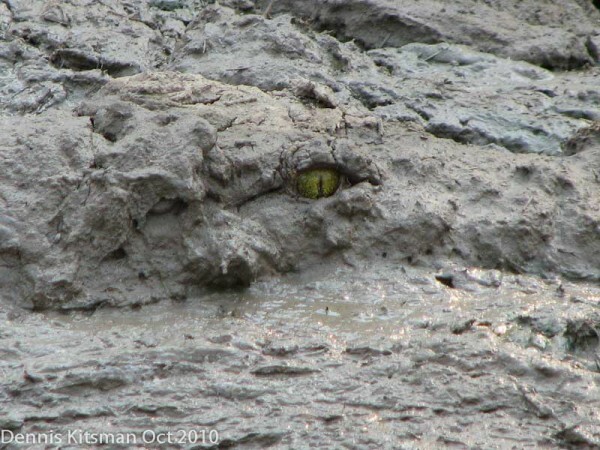 My effort to record this spectacular site is work in progress – apologies for the poor quality of the image. 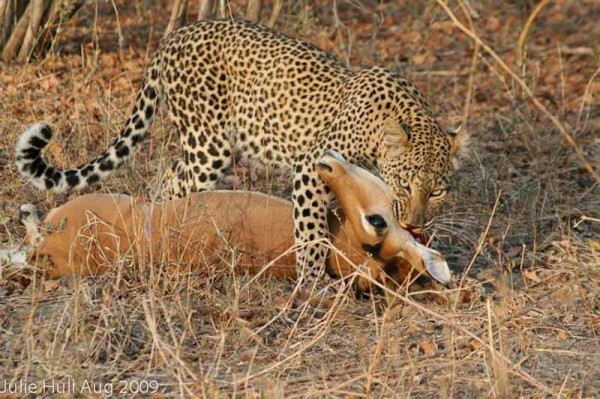 Finally – a true Kaingo or leopard – bed-time story for the kids. As the dry August days became hotter and hotter and the wind stronger in the valley – the beautiful mother leopard grew increasingly worried about the safety of her two young cubs – a boy and a girl. Each evening she would nurse her three month old balls of spots to sleep in their soft bed of leaves deep in the thickest of thickets and slink out without sound to the nearby plains to hunt. Returning after midnight she would wake them up and teach them the ways of the leopard. 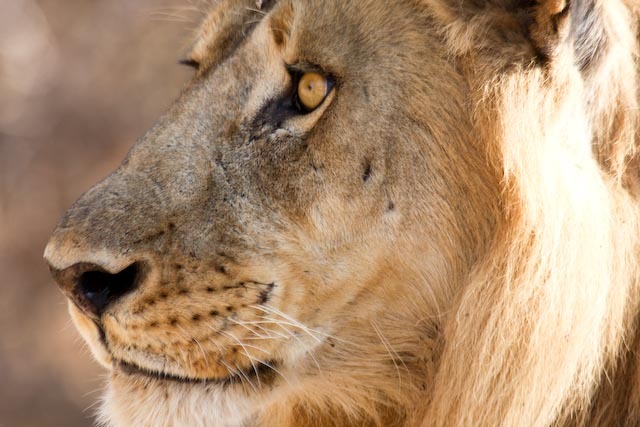 But their lair which had kept them safe for months from hostile hyenas and wandering lions was losing its leaves and becoming too open; it was time to move. 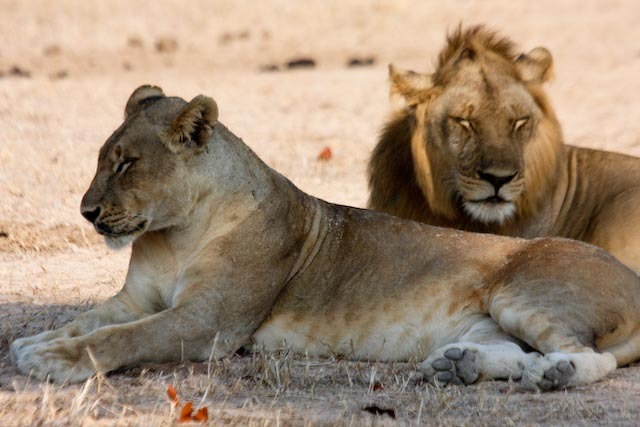 For the next three nights she called for the big male leopard – and father of the cubs. But her call was not answered. It seemed he was far away patrolling another part of the territory. So, she made a plan to seek her sister’s help. This meant leaving the two little ones for the whole night while she went far away across the dry river bed to the forest where she had her lair. That night she “nyonka’d” the cubs till their tummies were round like tiny beach balls – full of rich milk and set them to sleep. She brushed leaves over her tracks and started out on her long journey. After a long time she stopped and called to her sister. Immediately there was an answer and followed by a tackle and roll as they greeted each other with joy. The mother leopard told her sister of her worries that the cubs were no longer safe where they were and needed to be moved to the other safer thicket under the trees. They both set off at once towards the cubs. 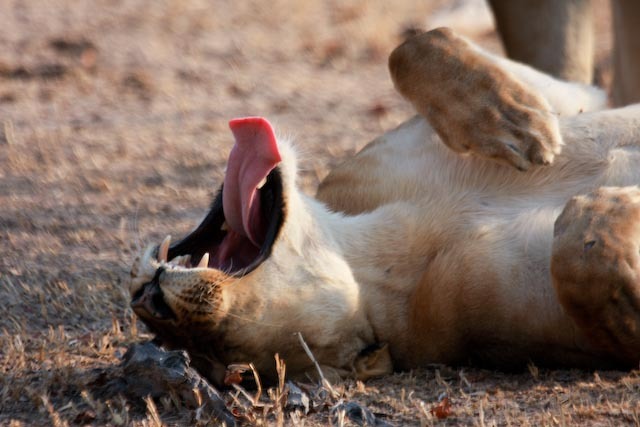 As the sisters arrived at the lair – they heard hyena’s laughing and calling excitedly. 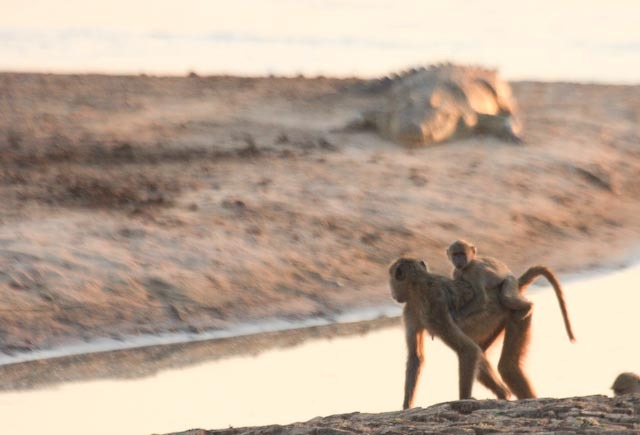 They feared the worst – perhaps the cubs had woken up, gone wandering and been caught. Just then came a deep growl which they recognized at once. 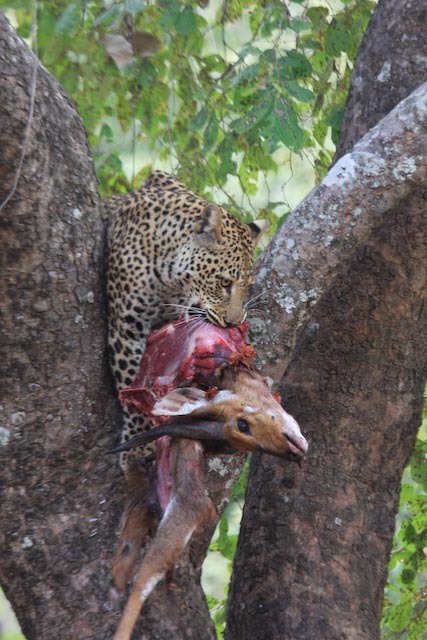 It was the big male leopard. 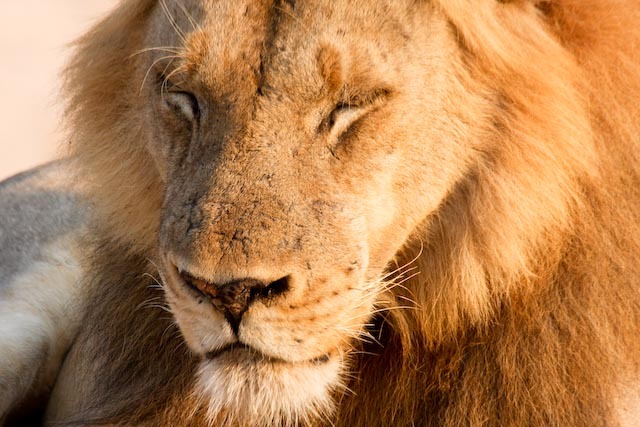 He had come back just in time to rescue the cubs and defend them against danger. After sometime the hyenas got bored and strolled away and the leopard family decided to make its move. They started off down the track towards their new lair – the big male in front, the mother and cubs next and last came the leopard sister. 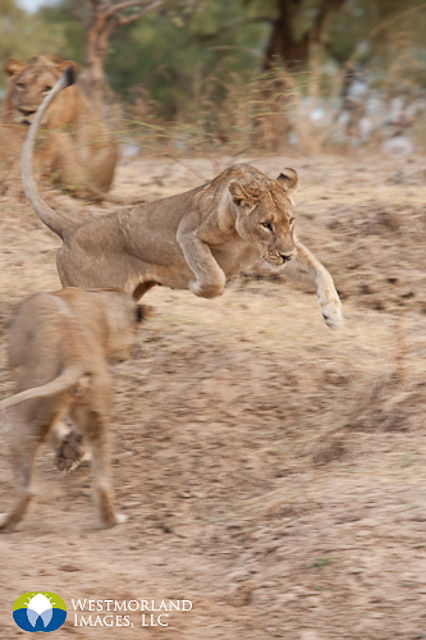 One by one in a line they walked – the cubs trotted excitedly following their mother’s white tail in front. At one stage they passed through a small human lair, an area of lights and excited whispers in strange languages. Finally the family of five leopards made it to their new home – a dense thicket surrounding two huge easy to climb ebony trees. They had made it! The end. 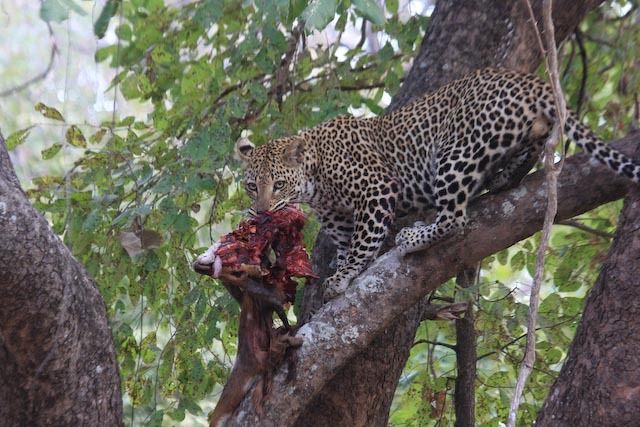 On 4th September 2011 at 07.00pm – a group of no less than five leopards in a line walked through Kaingo Camp to the delight of the staff ; all the guests were out on night drives looking for leopard! Until next time- salani bwino. 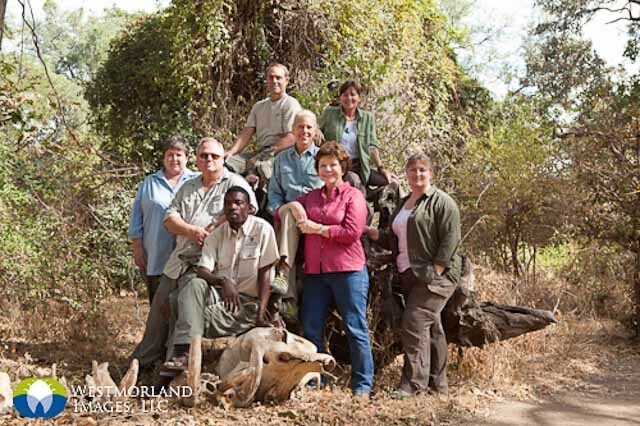 I had the pleasure of leading six intrepid photographers on Safari in July, 2011. 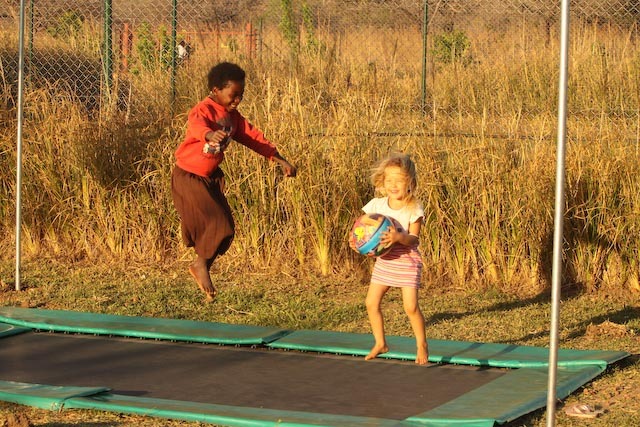 Although we visited other areas of Zambia, Kaingo reigned as the favorite camp. 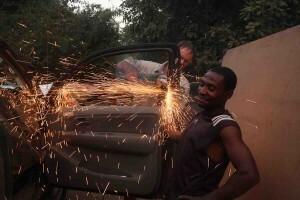 After we were greeted at the airport, our journey was to take about 2 hours to drive to camp. Everyone got a camera and lens ready to go since we were anxious to start shooting. Good thing we prepared ourselves, because once we entered the park there were many great photo opportunities. 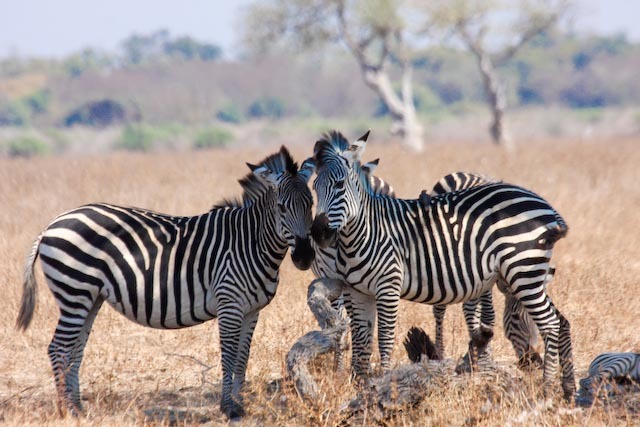 Zebra and antelope were grazing is beautiful golden fields and elephants brought us to a stop as they crossed the road. The group quickly began to capture some lovely images. 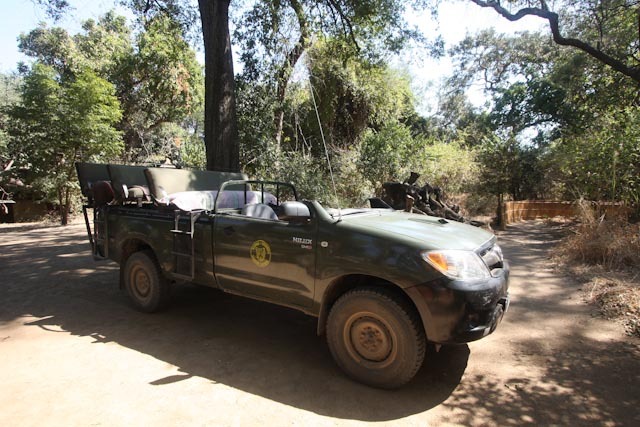 Once we arrived at the picturesque setting for Kaingo Camp, the staff was waiting to make sure we were settled in our cabins, fed and on our way to do our first drive. We all saw potential in the stunning ebony forest adjacent to camp and made a plan to photograph it in the early morning hours. 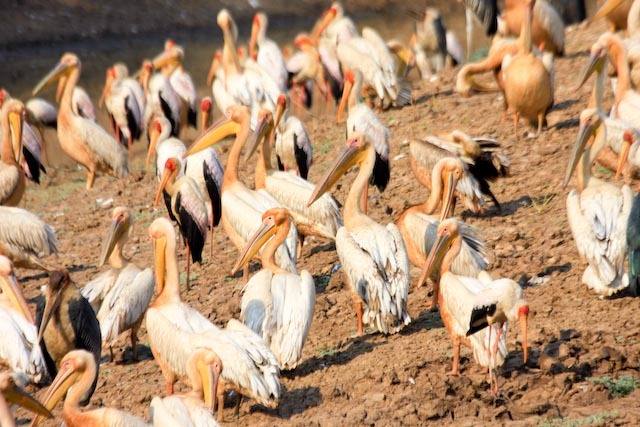 In the meantime, we discovered the rich bird life that inhabits the shallow ponds. 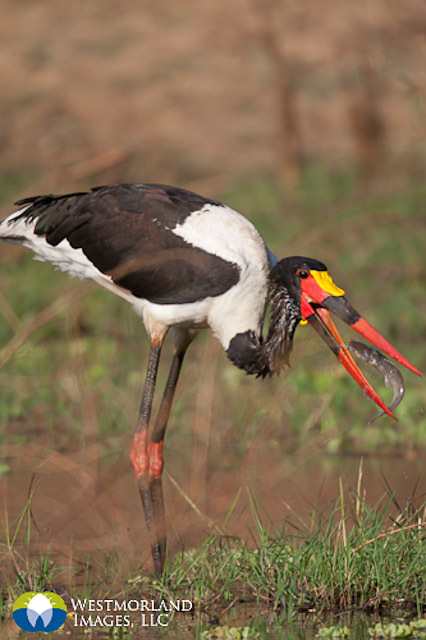 Wading birds such as saddle-billed stork, plovers and jacana were in good numbers. An Egyptian geese pair hurried their goslings to safety while a juvenile martial eagle sat in the tree above looking for an opportunity to scoop up easy prey. 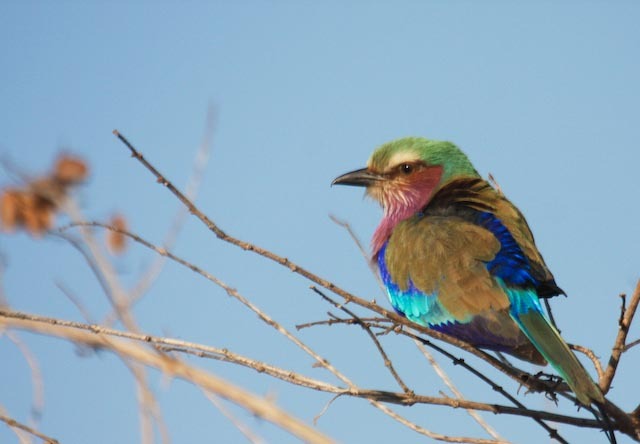 Colorful birds such as lilac breasted rollers and white-fronted bee-eaters were numerous. 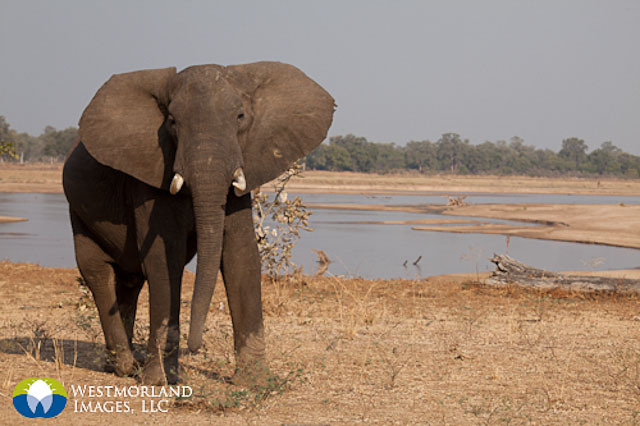 But like most safari photo shooters, we couldn’t wait for the big stuff. 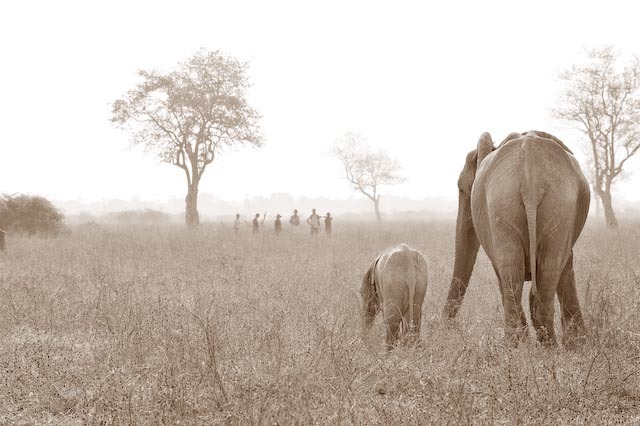 I don’t know of a better camp than Kaingo for capturing compelling images of large animal life. 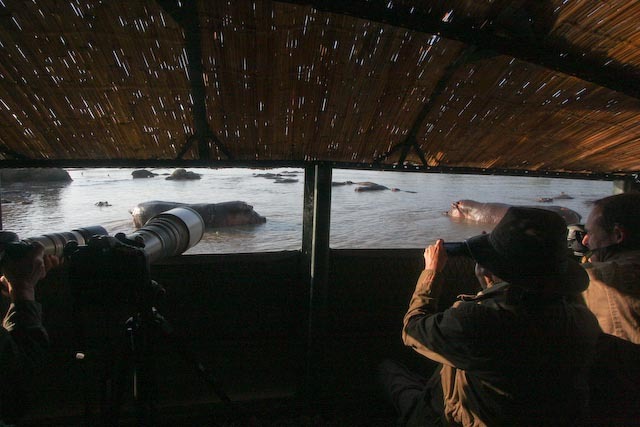 For my guests, the hippo hide was by far the most exciting. Derek has built an impressive structure with two levels right on the bank of the river. 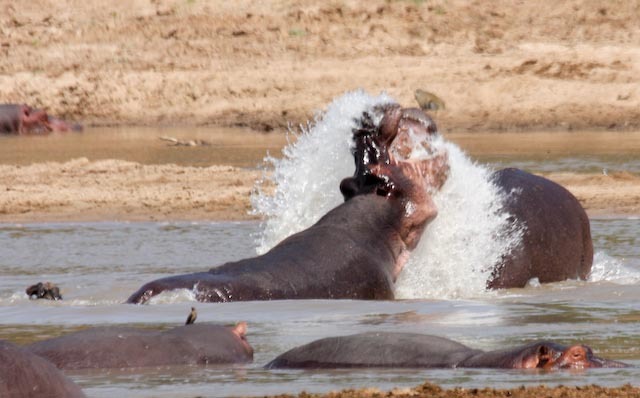 Grunting, splashing, yawning and sparring were perfect for not only still images – but also for my video shooters. It was agreed by all that spending a great deal more time at the hide would be well worth it. 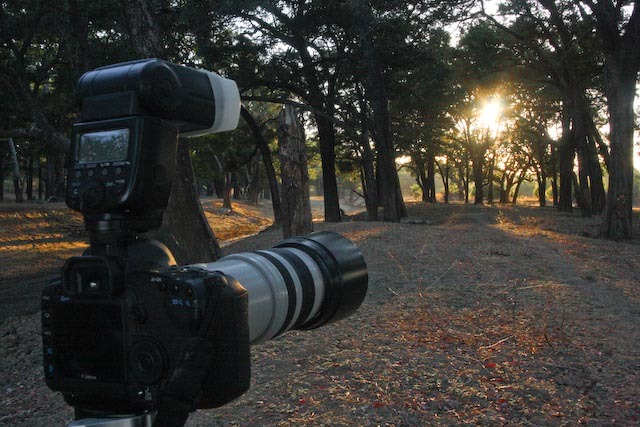 We got our wish for an early morning shoot in the ebony forest. 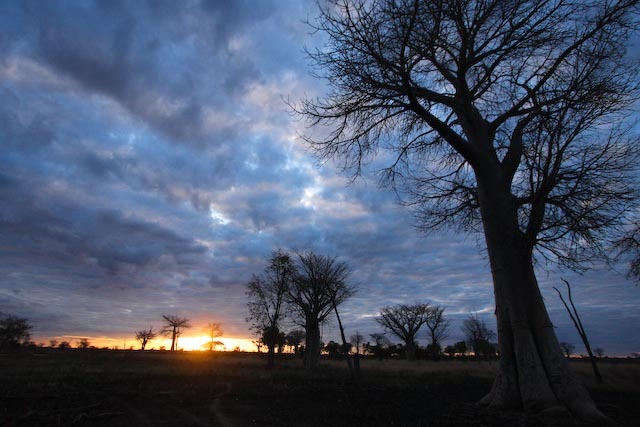 Warm light from the rising sun penetrated the forest as baboons scampered on the forest floor. 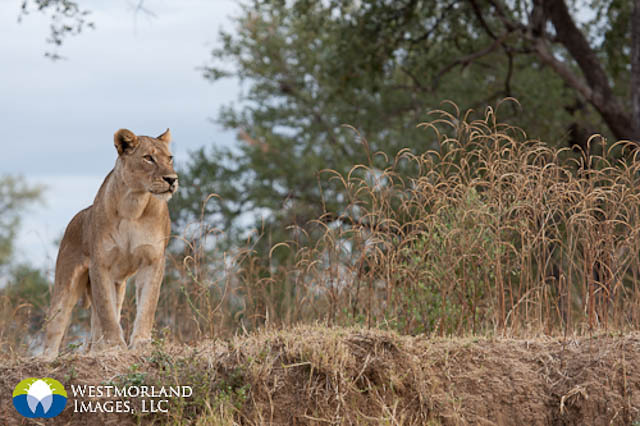 After capturing some great landscape shots, we moved on to begin tracking the lions. 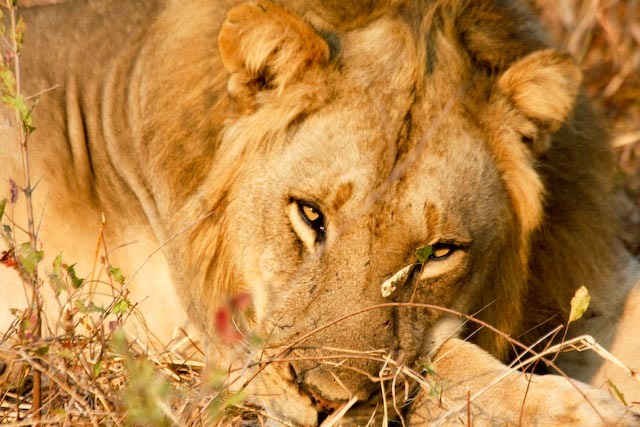 Not only did we find them, but we had more than enough resting lions to shoot. Later on we saw a bigger male and three lionesses on the move and captured a greeting with nuzzling and playing, which made for some great photos. 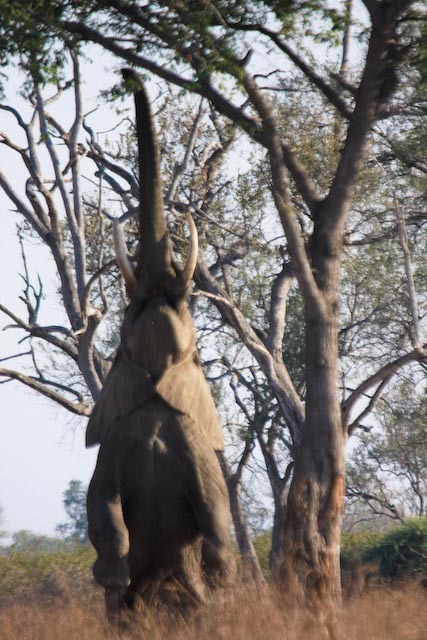 Although we did not get a huge number of elephants crossing the river, it is very apparent that the viewing platform above the river is an awesome location to get some great images from upper angles. If you are really adventurous, the camp will prepare it for an overnight. 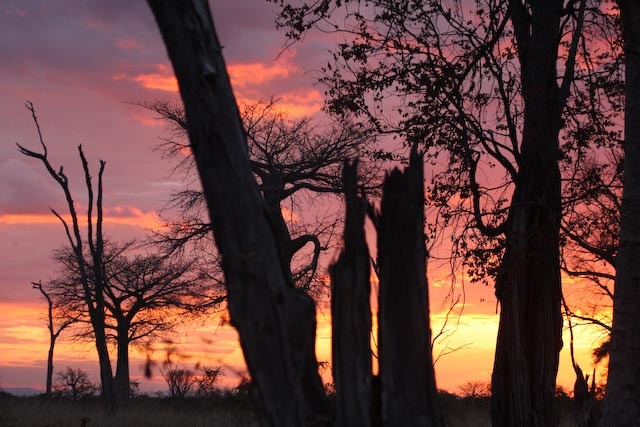 We only had 3 days at Kaingo – way too short to fully appreciate all there is to see and do. 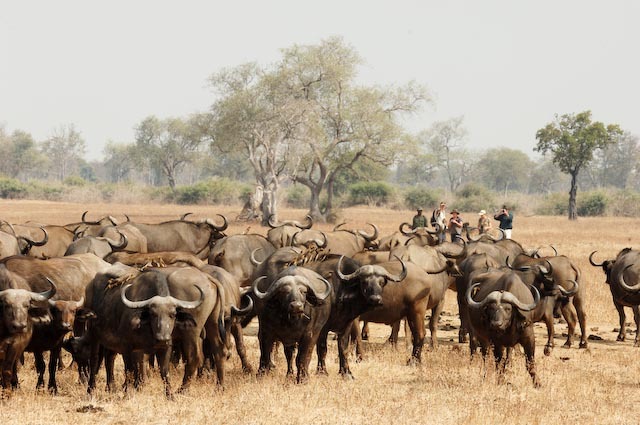 It is a camp that should get more time, and my next safari will plan for it. I haven’t commented on the camp service, food and accommodations yet, but it only takes one word to summarize it- AWESOME! ABOUT THE PHOTOGRAPHER. 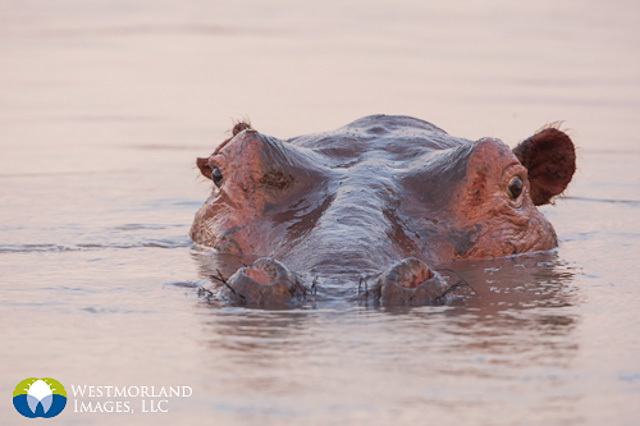 Michele Westmorland is a passionate conservation photographer and is proud to be a founding member of International League of Conservation Photographers. She has gained international recognition with her underwater and cultural photography. Her book “Ocean Duets” was published in 2006 and is focused on the beauty of the underwater world. Michele’s documentary film and book project, Headhunt Revisited, emphasizes the importance of cultural preservation. 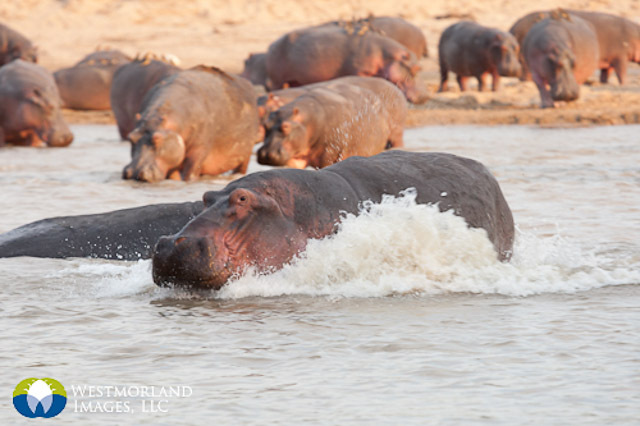 Michele’s company, Westmorland Images, LLC (www.westmorlandimages.com), incorporates underwater, architectural, lifestyle, and travel photography to produce stunning marketing images. Michele Westmorland has also created a vast library of imagery from around the world to fulfill various stock photography needs. 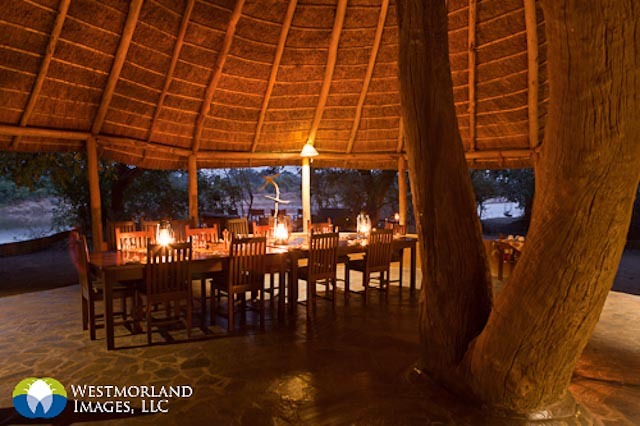 Whether covering exotic resorts in tropical locations, live aboard dive boats, or the wonders of the natural world Westmorland Images understands that a successful brand is actually an all-encompassing visual story. 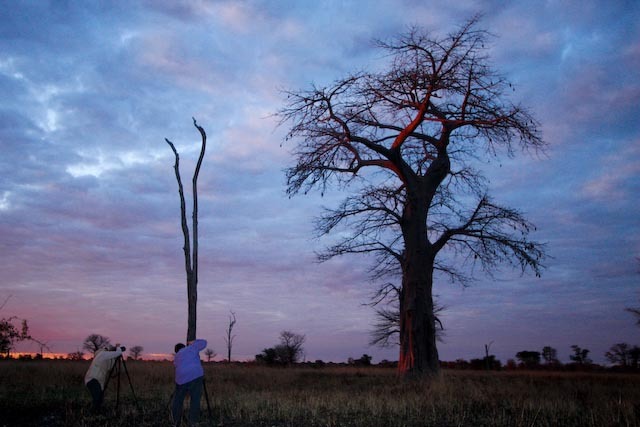 Michele also leads a series of small size photography tours specializing in wildlife and local culture. Michele is also a Fellow National of the prestigious Explorers Club, a member of the Society of Woman Geographers, Wings WorldQuest, ASMP and NANPA. 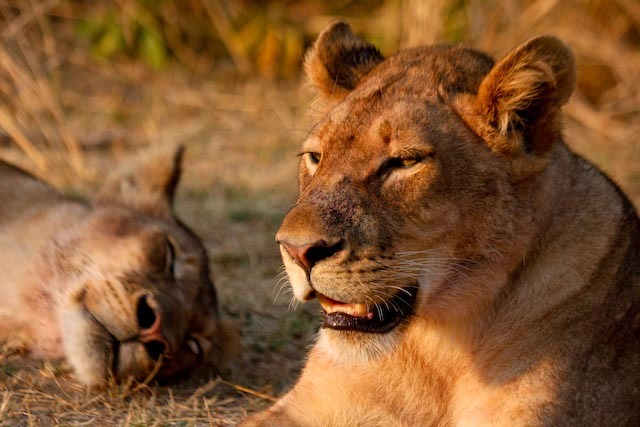 Every month, Shenton Safaris will select 3 pictures among those taken by our guests during their visit at Kaingo and Mwamba. Make sure your best shots are emailed to us so we can add them to the pool. 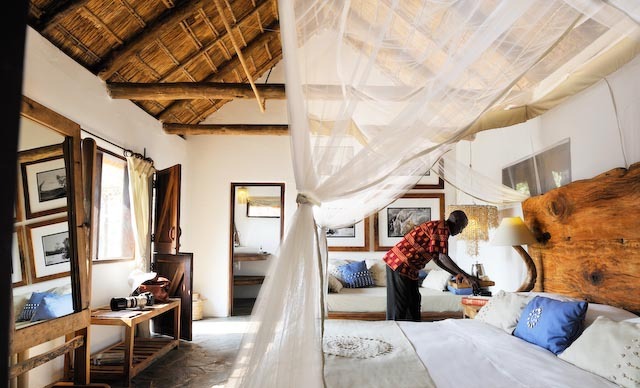 There is no time limit, and this is totally informal – we just want to acknowledge the fantastic work done by our guests. Below are our WINNER and RUNNERS UP, for our first Picture of the Month selection. Congratulations to Dennis, from Hawai, for his amazing shot. By Dennis Kitsman, September 2010. Settings: Canon PowerShot S3 IS 1/400 sec at f/3.5 Focal 72mm. 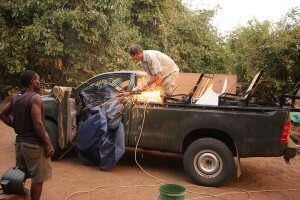 I’m Dennis Kitsman from Hawaii and have had the Africa bug since my first trip in 2005. I’ve been six times since and hope to make it back soon. 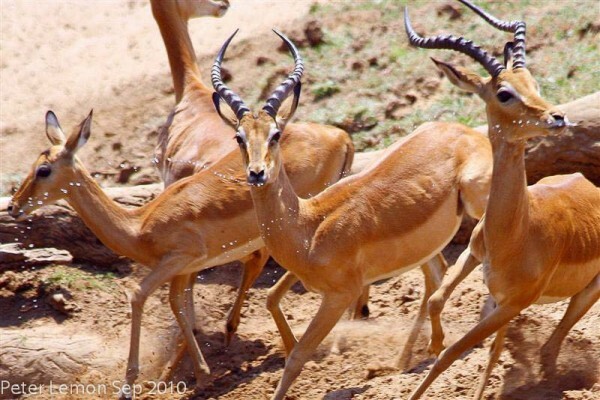 Hyenas and ellies are my favorite animals but am happy watching the antelopes as well. 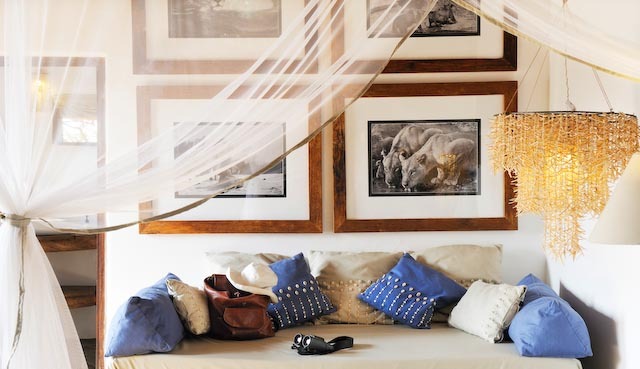 A day in Africa is better than a week at home. I was at Kaingo September 2010. By Julie Hull, August 2009. Settings: Canon EOS REBEL XT 1/320 sec at f/6.3 Focal 155mm. ISO 400. I live in Shoreline, Washington, in the US. 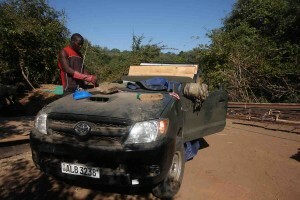 My husband, Tom, and I stayed at both Kaingo and Mwamba in August 2009 with our three children. As our son had just graduated from college, we wanted to take one last family trip before he started a full-time job, and we decided a safari was the perfect idea! My passions include travel, mountain climbing around the world, cycling, and photography. I am also a freelance copyeditor and spend most of my time helping high schoolers with college application essays. Tom and I traveled back to Africa this winter to climb Kilimanjaro, which was fabulous, but nothing will top the experience we had at both Shenton camps. We really hope to get back there someday! By Peter Lemon, September 2010. Settings: Canon EOS 400D 1/500 sec at f/7.1 Focal 300m. ISO 200. I’m Peter Lemon from Australia. 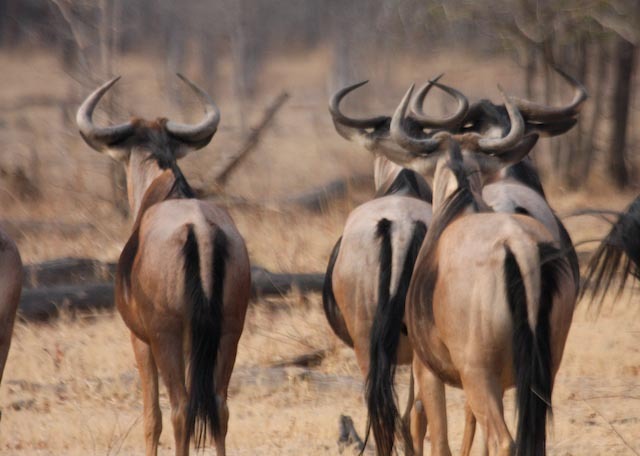 Fanatical wildlife photographer – especially African wildlife. Still aiming for that National Geographic front cover. 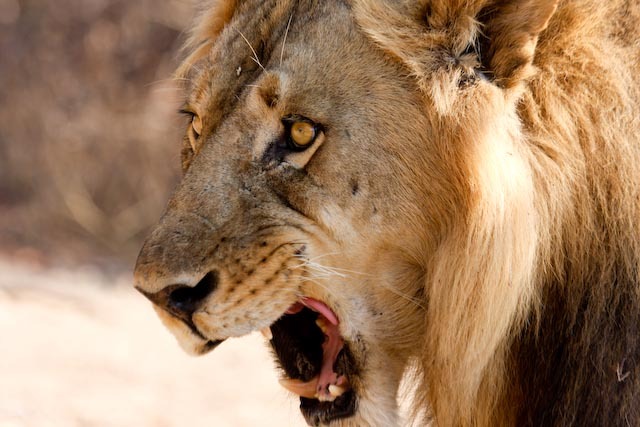 I have visited Kaingo and Mwamba each dry season since 2006, especially for the photo hides, and the “Hollywood” lion pride, and the brilliant photo opportunities they often provide. I love the sense of remoteness of these camps.